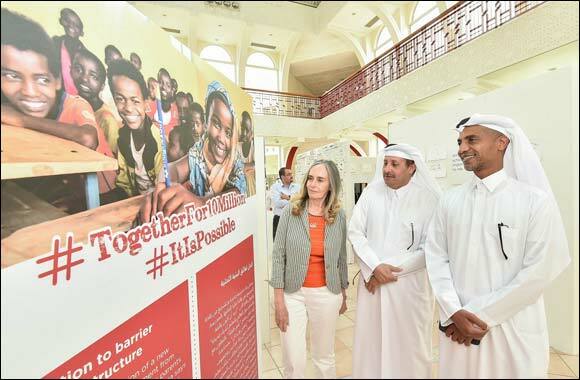 Doha, Qatar, May 16, 2018: Following last month’s high-level event in New York, Education Above All (EAA) Foundation hosted its ‘Reaching 10 Million Out of School Children’ exhibition at Qatar Academy from May 7-14, 2018, to mark a major milestone in empowering 10 million marginalised and vulnerable children around the world. EAA’s exhibit will move to the W Hotel from May 17-30, 2018, however EAA invites all the public to visit the ‘Reaching 10 Million Out of School Children’ exhibition. With the hashtag #Togetherfor10million and #Itispossible, the event was successful in creating awareness about the barriers to education, such as poverty, conflict and natural disasters, which millions of children around the world face. The exhibition was spread out under different zones: Conflict Zone, Zones of peace, Tree Zone and School Zone. In the Conflict Zone, guests were able to experience a war zone using visuals and sound effects. Afterwards, guest moved to the dark room where a Neon art piece translated the word “education” in Arabic to emphasize how education is the light in the darkness. For EAA, ‘Knowledge is Light’, and last month EAA lit up major landmarks in Doha and New York to celebrate its achievement. The light installation was followed by a display of an art piece dedicated to EAA’s achievement of reaching 10 million out of school children around the world. In the tree zone, guests were introduced to some of the challenges that refugees face, and given the opportunity to present solutions to educating hard to reach children who face those challenges. In the School Zone, EAA portrayed the difference between a school in a well-developed country and a school in a poor country. Kids were given a chance to showcase their ideas by way of paintings and drawings to project as to how the how the future should look like.